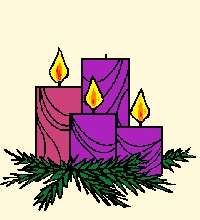 The term Gaudete (Sunday) is taken from the first word of the entrance antiphon (introit) of today's Mass. The Church seeks to remind us that our waiting is a cause for joy and rejoicing because of the Hope we have in the promise of the Lord's coming. The theme of OUR readings this Sunday is Rejoice, the Lord is near! Our first reading (Isaiah 61:1-2, 10-11) is a call to rejoice in the promise of the Lord's salvation. This is a promise that Jesus himself proclaimed as being fulfilled in his ministry. In the Gospel of Luke (4:16-22)there is the story of when Jesus visited a synagogue in his home town. After reading the words of Isaiah that we hear in today's first reading, Jesus rolled up the scroll, sat down and said to the people "Today, this passage is fulfilled in your hearing". The spirit of the Lord GOD is upon me, because the LORD has anointed me; he has sent me to bring glad tidings to the poor, to heal the brokenhearted, to proclaim liberty to the captives and release to the prisoners, to announce a year of favor from the LORD and a day of vindication by our God. In last Sunday's Gospel, we heard Mark's introduction of John the Baptist. This Sunday, we hear from the Gospel of John (1:6-8, 19-28) as John the Baptist is even more clearly defined. "He was not the light but came to testify to the light." A man named John was sent from God. He came for testimony, to testify to the light, so that all might believe through him. He was not the light, but came to testify to the light. And this is the testimony of John. When the Jews from Jerusalem sent priests and Levites to him to ask him, "Who are you?" He admitted and did not deny it, but admitted, "I am not the Christ." So they asked him, "What are you then? Are you Elijah?" And he said, "I am not." "Are you the Prophet?" He answered, "No." So they said to him, "Who are you, so we can give an answer to those who sent us? What do you have to say for yourself?" He said: "I am the voice of one crying out in the desert, 'make straight the way of the Lord,'" as Isaiah the prophet said." Some Pharisees were also sent. They asked him, "Why then do you baptize if you are not the Christ or Elijah or the Prophet?" John answered them, "I baptize with water; but there is one among you whom you do not recognize, the one who is coming after me, whose sandal strap I am not worthy to untie." This happened in Bethany across the Jordan,where John was baptizing. In our Epistle reading (1 Thessalonians 5:16-24), St. Paul instructed his readers in how to live in waiting for the Lord, living in Hope, with a joyful heart. It is a lesson even more pertinent in today's world. Brothers and sisters: Rejoice always. Pray without ceasing. In all circumstances give thanks, for this is the will of God for you in Christ Jesus. Do not quench the Spirit. Do not despise prophetic utterances. Test everything; retain what is good. Refrain from every kind of evil. May the God of peace make you perfectly holy and may you entirely, spirit, soul, and body, be preserved blameless for the coming of our Lord Jesus Christ. The one who calls you is faithful, and he will also accomplish it..
At our midway point in Advent, we pause to rejoice that the Lord is near. Jesus is the fulfillment of the prophesy of Isaiah to bring glad tidings to the poor, heal the broken hearted, proclaim liberty to captives, release to prisoners and a year of favor of the Lord (Jubilee year), when all debts will be forgiven and even the poorest of creation will receive a clean slate and a fresh start. Our Hope is palpable. It is not a wish like hoping to win the lottery. It is an expectation, founded in faith and nourished through the love of our God. We indeed have cause to rejoice. Would it be that we could heed St. Paul's call, "Rejoice always, pray without ceasing."